Botanical Name Embelia ribes BURM.F. It is an Indo-Malesian species, reported from India, SriLanka, Singapore, Malayasia and S.China. It is found to occur throughout India in Central Himalayas, Arunachal Pradesh, Assam, Maharashtra, Andhra Pradesh, Karnataka, Kerala and Tamil Nadu. This species is globally distributed in Indo-Malesia. Within India, it is found throughout up to an altitude of 5000 ft. The fruits and root of Vidanga is used in the form of powder and paste to treat worms, heart-diseases, skin diseases, pollution of earth, headache, jaundice, poisoning and as rejuvinative.Worms:1. Vidanga excels as anthelmintic and is used in food and drinks, bath, fumigation and anointment. 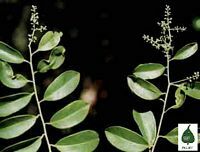 (CS.Ci.7.159),2.Warm decoction of vidanga and aragvadha (cassia fistula) should be given to those suffering from worms (3\40-60 ml) (AS.U.49.91).Diabetes:Powder of vidanga, triphala (Phyllanthus emblica, Terminalia chebula, Terminalia bellerica) and pippali (piper longum) taken with honey destroys skin diseases, worms, diabetes, sinus and fistula-in-ano (10-15 gms) (SSR.12.33).